StrongVPN is one among the leading VPN providers in the world that is based in the United States.From our StrongVPN review, we found that they provide an excellent service to their clients using VPN, PPTP, L2TP and SSTP Protocols.They have a well-structured user-friendly website that makes it easy to subscribe to their services and install their client software. The website also plays a major customer support role. They provide Developer/ Engineer Tech support at your service around the clock. StrongVPN specializes in high-quality fiber network bandwidth. Some of the pros include having over 600 VPN servers in 22 countries, unlimited bandwidth, no logging at all, works with Netflix when most other VPN’s don’t, works in China, a wide range of device compatibility, allows Bitcoin payment and a 5 days money back guarantee. On the negative side, they don’t have a free trial which is important for clients can test the service before purchasing. However, the money back guarantee ensures that if a client is not satisfied, he can get his money back. In our StrongVPN review, we found that it is a sister company of Reliable hosting which was formed in 1994. The company had a humble beginning selling dial – up internet services through their website and grew steadily to become a giant with worldwide popularity. At the Centre of StrongVPN’s rapid growth, was and has always been a deliberate move by the company strategically to offer the best customer experience in the industry. According to their official website the www.strongvpn.com, they hold a firm view that a strong customer service culture is critical for business growth. Currently, the company enjoys location at the 200 Paul ExchangeColo facility in Francisco that is run by Digital Realty Trust. The Francisco facility offers them an ideal location for bandwidth capacity, peering, and growth. They also have another base at Internap in New York. 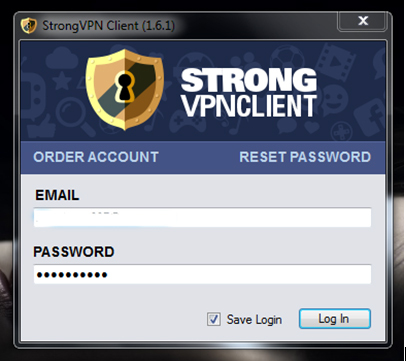 StrongVPN provides free client software for Windows, MAC, OSX, IOS, and Android. 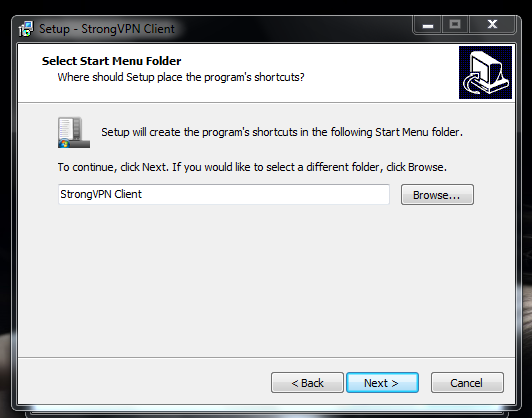 For out review of StrongVPN we wanted to really test it out thoroughly so we started at the beginning and proceeded to the StrongVPN website to download and install the Windows client. 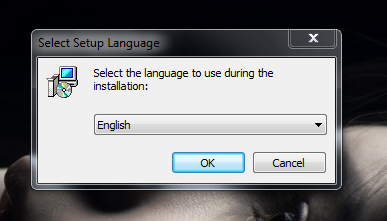 When you begin downloading, pop-up screen appears asking whether you have chosen to open the file and what you intend to do with it. We chose to save the file. After saving the file, another screen appears asking whether you wish to run the file. We chose to run the file. Another screen pops asking you to choose your desired language from a drop down – menu. We chose English. After choosing our language, The Strong VPN client setup wizard appears which will install StrongVPN client version 1.6.1 on your computer. It is advisable to close all other applications before clicking next to continue with setup. We were then asked to accept the license agreement. You must accept the agreement otherwise; you cannot proceed with the installation process. You are requested to select your desired location. After choosing where your Windows client should be installed, you go on to select your preferred “Start Menu Folder” where setup places the program’s shortcuts. 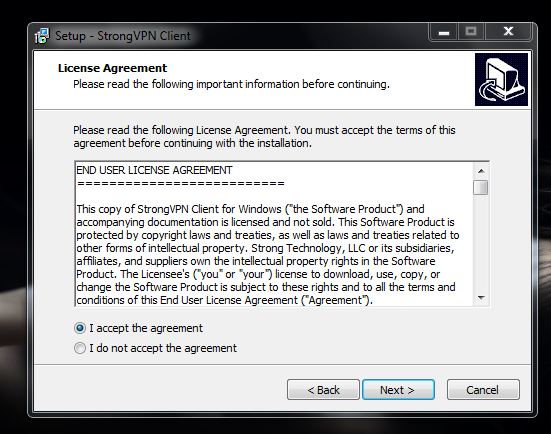 A dialog box will appear asking you to install the strongVPN client on your computer. 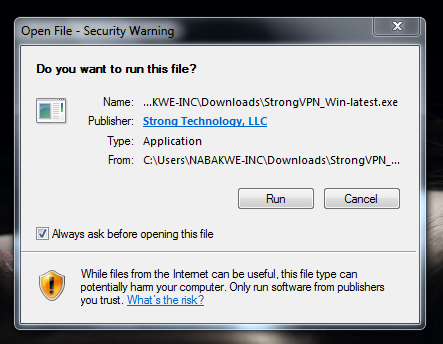 On clicking the install icon, installation takes place in a matter of seconds after which you are asked whether you would like to launch StrongVPN client. Clicking on finish, the StrongVPN client provides you with a two field login window. You need to enter the email address and password you registered during sign up process and click on login. StrongVPN will automatically authenticate your credentials and log you in. From our StrongVPN review, we found that the VPN provider has a strong network of servers which are growing by the day. They currently have around 600 VPN servers in 22 countries that support over 87,000 IP addresses worldwide. Server locations are spread across different cities in different continents. Czech Republic – Prague; France – Roubaix; Germany – Dusseldorf, Frankfurt and Munich; Italy – Milan, Latvia, and Riga; Luxembourg –Contern and Steinke; Netherlands – Amsterdam; Norway – Oslo; Romania – Ilfov; Russian Federation – Moscow; Sweden – Molkom; Switzerland – Basel and Zurich; United Kingdom – Canterbury, Livingstone, London, Maidenhead, Manchester, Nottingham and Rugby. Hong Kong – Hong Kong; Israel – Tel Aviv; Japan – Tokyo; Singapore – Singapore; Malaysia – Kuala Lumpur; Turkey – Istanbul. StrongVPNuses OpenVPN as their primary default protocol. All data is by default encrypted and decrypted using 256-bit encryption and data authentication via digital certificates. In our StrongVPN review we discovered that the service is popular with many VPN users owing to its wonderful features. With StrongVPN, you get two main pricing plans on offer. The first one is a monthly plan that is priced at $10 per month. The second plan is where you sign up for 12 months and save 50% off the regular monthly payment i.e. you pay $4.95 per month. The good thing is that both the two plans come with a 5-day money – back guarantee. Another advantage is that both the two plans give you access to 600 StrongVPN Servers in 22 countries. Many reviewers are happy with the fact that they can share their VPN connection with multiple devices which includes but not limited to PS3, Xbox,Boxee Box,Roku, Apple Tv and much more. Windows XP, Windows Vista, Windows 7, Windows 8, Windows 10, Windows Mobile, MAC OS, IOS, LINUX, HP Web OS, Google Chrome OS/ Chromium OS, Bada,Symbian, Sabai OS, TomatoUSB, DD – WRT Router and Mikrotik Routers among others. Also, if you install StrongVPN on a compatible router then you will be protected behind ANY device connected to the network. In this StrongVPNreview you can see that the VPN service works on mobile devices (PPTP & L2TP)iPhone,iPod, Touch, Android and Windows mobile. IKEv2 protocol can re-establish internet connectivity. Thus, it’s the most ideal protocol for mobile phones. Arguably, StrongVPN has one of the best customer supports in the industry. Their customer support is highly experienced. Moreover, they have worked together for a long period. Thus, you are taken care of by a strong team. We really liked their live support. They provide around the clock email ticket for technical queries. They have an Online – support Form. The form has fields which you complete with your name and email address and a short description of the challenges you may be facing. After submission, a highly qualified support staff gets in touch with you promptly. We were impressed by the fact that a support staff can install the VPN client for a customer remotely. 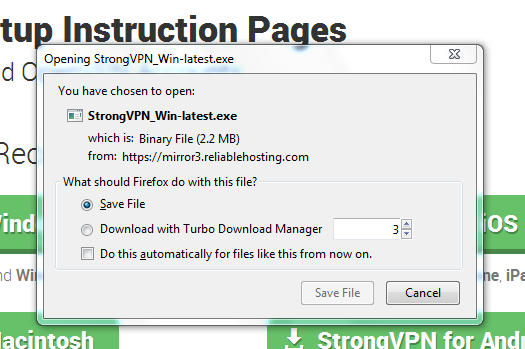 A main testing area we look at in out review of StrongVPN is privacy. StrongVPN maintains your online activity, location, and identity private by encrypting your data with 256-bit encryption and channeling it through remote servers. StrongVPN does not keep logs of a client’s online activity. Not keeping logs is an assurance that even if they are requested by the strength of a court order to provide logging activity, they won’t have any. From our findings of our StrongVPN review, we conclude that StrongVPN is on the right path to becoming the leading VPN service provider in the market. They have one of the strongest customer support departments in the industry. Their 50% off on a 12-month subscription has many customers switching to them. StrongVPN has consistently increased its number of servers and locations. However, they need to have a presence in Africa which is embracing information technology at a high rate.